This post first appeared on April 10, 2019 in Systems Leadership. Our second year of Systems Leadership started off with one of the most interesting combinations of new technologies and new business models that we have seen since we began exploring the Systems Leadership topic. Young Sohn, President and Chief Strategy Officer of Samsung Electronics, has been with Samsung for almost seven years and has been instrumental in helping move a company of incredible size and scale into new areas including the changing automotive and mobility industry. His extensive background in the semiconductor industry and as a leader of public companies provided invaluable domain expertise as he began working in Samsung’s core electronics business, but it has also been his ability to navigate and understand Silicon Valley that has provided unique insights and perspectives which he has used to guide the company into an incredibly active corporate venture business and into bold acquisitions such as the purchase of Harman International for $8 billion. Sohn shared some of his insights last Thursday in our first session of this year’s Systems Leadership course. After we finished teaching the Samsung case, Sohn came to the front of the room and talked about how he looks at systems as he watches how the various parts of Samsung interact not only with organizations outside of the company, but also how they collaborate and must earn business with each other inside of the company itself. He described one of Samsung’s core competencies as the ability to do incremental continuous innovation towards achieving product leadership positions in industries, and how the company seeks to work with best-in-class partners whether they are inside or outside of the organization. He highlighted that this thinking serves as an advantage for Samsung as they have the heft and resources to be patient when entering new markets. The company’s annual budget of over $45 billion spent on technology, R&D and manufacturing allows them to patiently approach big markets that are going through huge disruption, and Samsung can either enter these markets directly or partner with incumbents who will need additional skills and competencies as their industries change. At the same time, Sohn and his team have demonstrated the ability to experiment internally and manage modest-sized groups as they explore new areas. These actions can be seen when his team spins up a small innovation group to look at a new area, with Samsung’s evergreen venture fund which is extremely active in a variety of sectors, or when his team leads a major acquisition. And they are not deterred by failure — all of the ideas Samsung explores do not work, but they continue driving forward and incorporate their learnings in future activities. Sohn talked about Systems Leaders’ needing to operate simultaneously in both big and small, and he shared how Samsung attempts to do this through the various ways his group is structured, organized and measured. When operating in a large company like Samsung, with over 320,000 employees globally, the constraints and structures of a large organization can become a gravitational force that prevents employees from looking at the outside world and seeing new trends or interpreting the importance of new innovations. Sohn highlighted two areas where Samsung’s unique lenses have shaped the company’s actions. First, he talked about how Samsung sees automobiles becoming more like “smartphones on wheels.” With increased computing power, communication capabilities and entertainment systems, mobility in the future will not only connect directly with people’s smartphones, but the vehicles will act and behave like actual smartphones. Samsung, which has over 22% market segment share of smartphones globally, and also provides components (screens, processors, memory, etc.) to almost every major manufacturer of these devices, realized that they both have the opportunity to and also the need to play a major role in the transformation of the mobility industry given the trends in electric and autonomous vehicles. The company’s acquisition of Harman International (where Sohn is now Chairman) was driven by the company’s unique perspective of how the world outside of Samsung was changing, and how Samsung saw that it actually had some key capabilities that could be levered in light of the mobility industry’s radical changes. Similarly, Samsung also realized that the process for successfully making pharmaceuticals at scale is driven by being having disciplined process manufacturing — something at which Samsung excels through its activities in making everything from semiconductors to the largest ships in the world. After exploring and eventually entering the biologics area, the company now has over 10% of the world’s capacity to make drugs that are based on antibodies. Through this activity the company built an entirely new core competency based on seeing a connection between a market need and the company’s own internal capabilities. This new business now delivers revenues of millions of dollars per year for the company. As a maker of televisions, smartphones, computer memory and electronics, Samsung’s reputation is often as a digital leader. But at one point Sohn talked about the importance of analog. It was fascinating to hear Samsung’s Chief Strategy Officer, whose company makes the products that store over half of the world’s data, wax poetic about the importance of analog. And while Samsung’s business is both to sell end-products and also components, it was Sohn’s appreciation of things that Samsung does not make which showed the attitude that is enabling Samsung to work on combining the best of digital and physical. 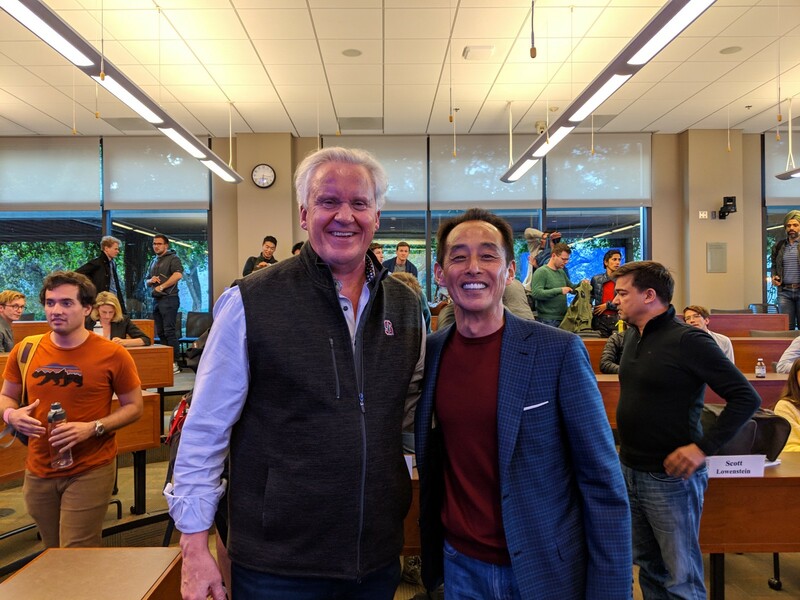 And, as most products, services and companies will need to master both of these domains, Sohn shared how he and the company have been working as Systems Leaders in their endeavors.